Meeting new people and making new connections is wonderful but having a close friend in a nearby city is THE best. Even better when that friend lives in a cool Southern city I want to visit all the time. 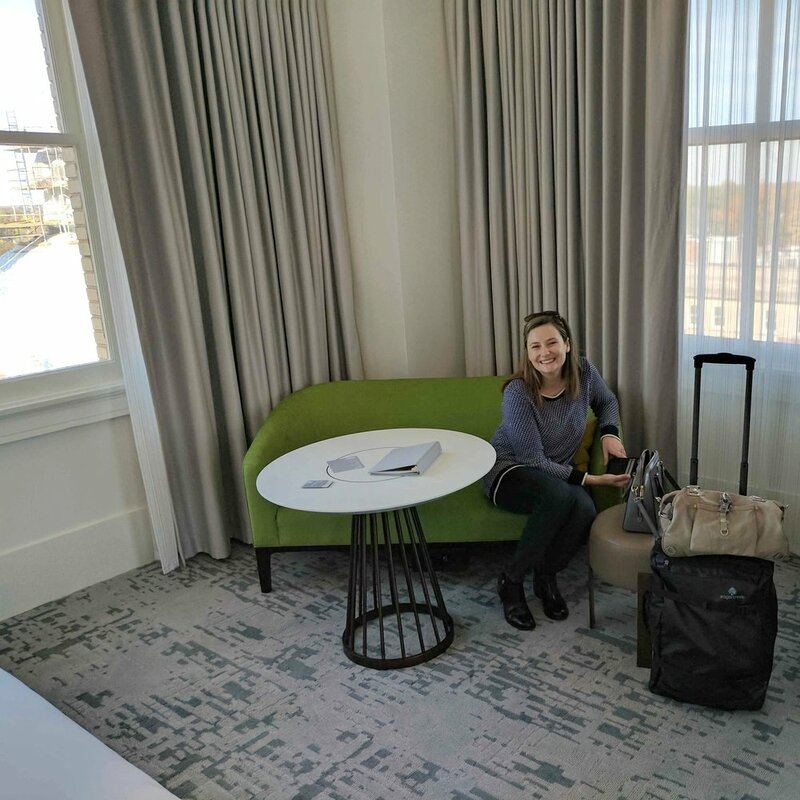 My childhood friend Celia has been living in Lexington for a few years so when I heard 21c opened a hotel in Lexington, I immediately started planning our girls weekend. An exceptional hotel can turn a night away into a vacation. 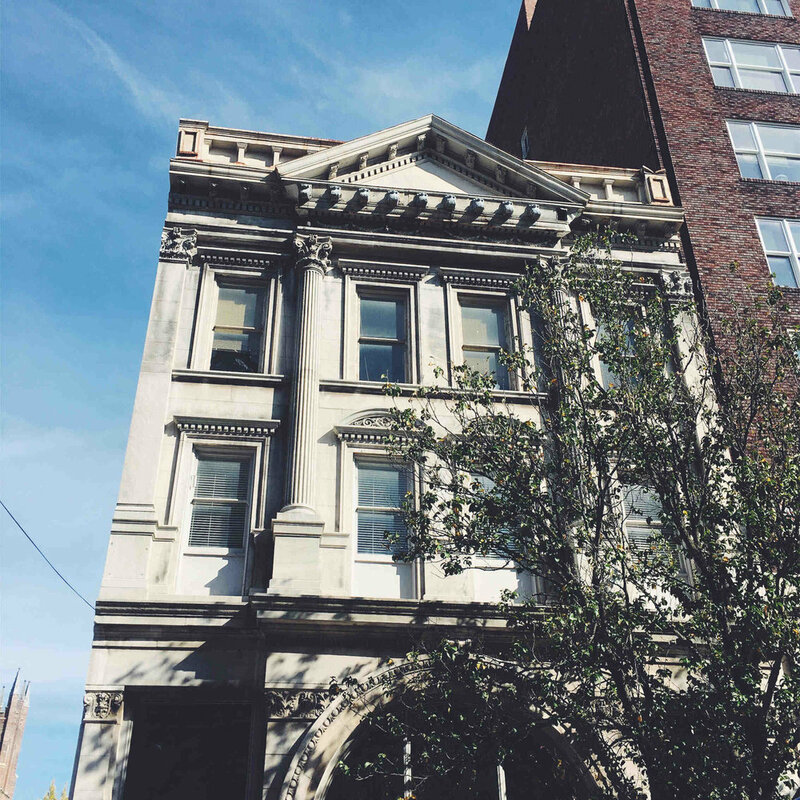 Like most of their hotels, the 21c Lexington is a remarkable adaptive reuse project featuring the 100 year old Fayette National Bank Building while the interior is sleek and modern perfect for their rotating contemporary art exhibits and a myriad of travelers. We arrived a little early to check in but it's no big deal. The staff is so accommodating; they stored our luggage and took my cell number so they could call when our room was ready. 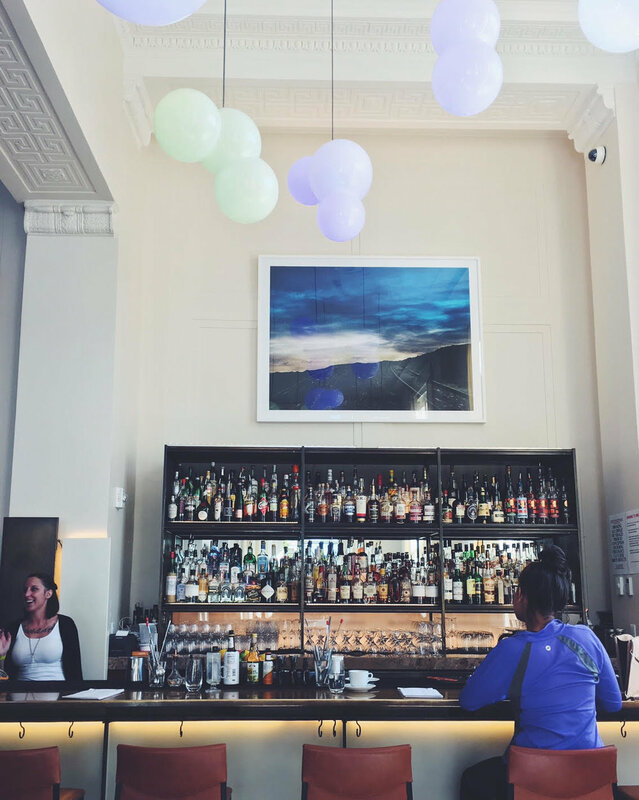 We decided to wander through the galleries and grab a drink at Lockbox. 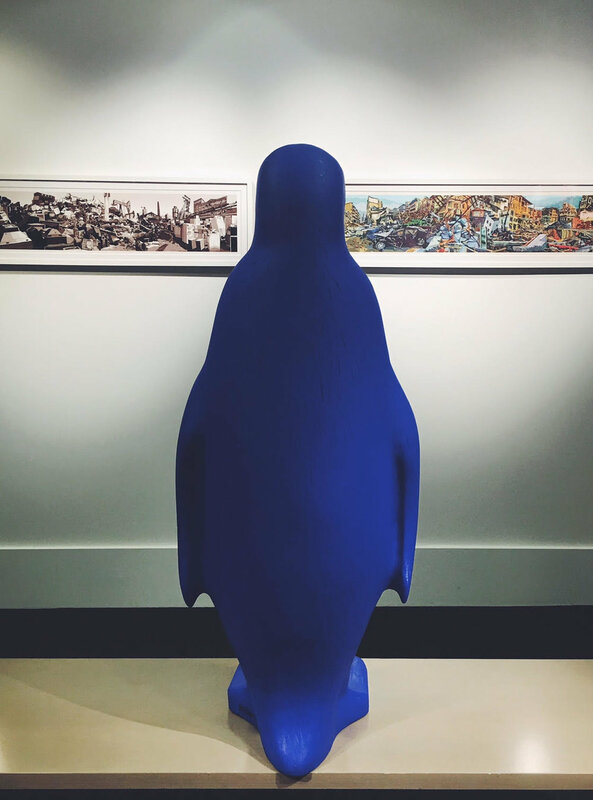 You may be wondering what is the deal with the blue penguin? Well they are actually part of an art piece by Cracking Art Group. “ Our elected material is ‘plastic’, containing the whole experience of the planet, natural / artificial, ancient / future, and in which we seek the archaic anthropological, vegetable and animal origins, in order to build a new kind of iconography.” The blue penguins are displayed throughout the hotel, one even made an appearance in my room. 21c rooms are modern but comfortable with bright white linens and funky accent furniture (notice the lime green love seat). The minibar is reasonably priced so if you’re in desperate need of a snack you won’t have buyers remorse over $8 mixed nuts. Each room comes with a selection of Lexington magazines, to help you get to know the city. And of course a Nespresso machine in case you need an extra boost during your stay. Their turn down service was a wonderful surprise too. After a quick espresso in our room and a spin through the hotel gallery, we ventured out in downtown Lexington. From restaurants to public art, there is so much to do in this city! Here are a few places we visited, none of which are terribly far from the hotel. Ashland - The estate of Henry Clay a prominent political figure during the 19th century. We just toured the grounds but I’d be interested to do the full tour inside next time. Lexington Diner - yummy comfort food across the street from the hotel. Great breakfast. Lexington Mural Challenge - There are murals all over the city. Just start walking around downtown and you’ll start seeing them! Wine + Market - Fabulous beer and wine shop. They have a great selection of picnic supplies and a sandwich counter too. After a late night on the town (read more here), Celia slept in while I dragged myself downstairs to Yoga with Art. 21c Lexington hosts several fitness classes in the 2nd floor gallery space every month so be sure to check their calendar for dates and times. Classes are open to any fitness level and are only $5. After yoga, we headed downstairs for brunch at 21c Lexington's restaurant Lockbox. Spoiler alert, it was delicious. Their menu are distinctly southern, offering dishes like shrimp & grits and a fried chicken biscuit. Chef Jonathan Searle creates plates that are beautiful and comforting in every bite. The space is an architectural nerds paradise with high columns, huge windows, ornate plaster medallions, marble floors, and more. You can even rent out the original bank vault for a private dinner party. Next time I will definitely join them for dinner! I've said it before, but I love 21c hotels because they are incredible hosts for their cities but they are destinations themselves. Find out more about 21c Museum Hotels. 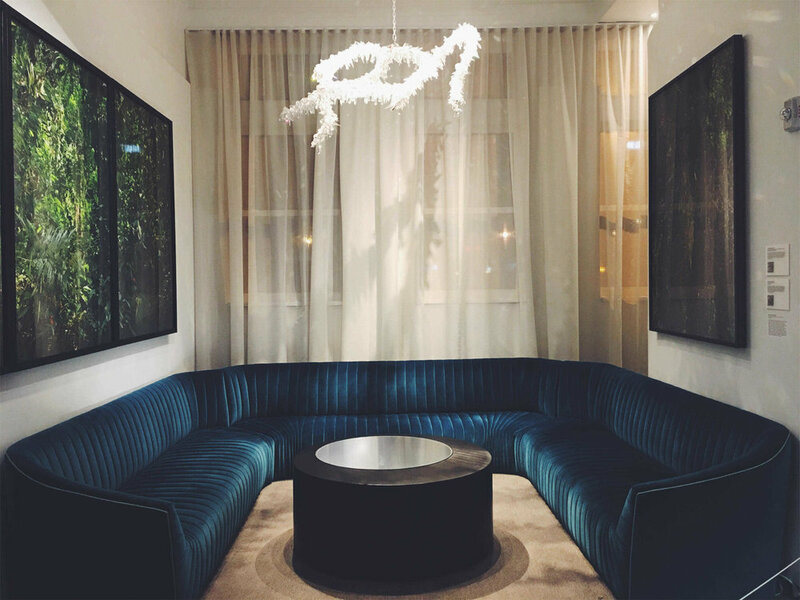 Have you visited a 21c Hotel before? Raised in the South with a love of Spanish moss, craftsman bungalows and front porches, I am Emily Hines, writer, dreamer and beer drinker. You can find me strolling down a century old city block snapping iPhone photos of colorful facades and searching for flea market treasures. With my burly husband Ryan, I enjoy searching for edible mushrooms to escape the hum of the city. He proudly donned the beard and man bun way before it reached the masses – a critical point he’ll remind you of whenever he sees an Urban Outfitters. Dog mom to two wild black lab pups: Junebug, in honor of the summer beetles she’d follow around as a puppy and Lula, my swimmer who was named after the Tallulah river in Georgia. Both constant companions. My traveling goal is to find the hidden gems. There are stories everywhere, you just have to find them. Let’s hit the road. Feb 15 Why a Travel Blog?